It's been 18 years since this ambitious and innovative nine-part science fiction audio drama first aired. On this site, we look back on that series and some of the other radio plays produced by Dawson Nichols and Jim Horne. You can still listen on this page, but with the new podcast, you get remastered pristine, high-quality audio files that fully reveal the rich sound. A radio adaptation of two other Dawson Nichols plays are added as bonus tracks, including the hit drama I Might Be Edgar Allan Poe. See the iTunes preview here. If you use iTunes, you can subscribe right there. This cutting-edge science fiction drama unfolds as a futuristic detective story. Murder, blackmail, conspiracy — and it may all be orchestrated by an Artificial Intelligence. Years ahead of its time, The Fourth Ambit is an exciting and thoughtful exploration of the future of technology. Gilles is doing research at a university when he stumbles onto some anomalies. His discoveries lead to a web of intrigue and danger he never envisioned — or wanted. Blackmailed into being a tracker, Gilles goes to work doing quasi-legal research for one of the corporations that run the Ambit. He soon discovers that the Ambit itself is but a shadow of a much more elaborate virtual world — The Second Ambit. Beneath that there is a Third, darker Ambit, which the corporations may not even control. And, if the rumors are true, a Fourth Ambit, built and controlled by a virulent AI. The Fourth Ambit is a nine-part science fiction radio play, drawing you into a detailed and fully-immersive world of the near future. Ambitious story-telling, sophisticated effects and music, and extraordinary acting combine for an audio drama experience like nothing you've ever heard. Each episode is 58 minutes. When Gilles can't control his addiction to online stimulants, he loses his graduate school appointment and his access to the Ambit. Poverty and a life of pointless toil seem to be his destiny, but when he stumbles upon one of his professors in a seedy bar, Gilles' fortunes shift. In his haste to leave, the professor drops three gold UNI cards he'd been about to sell on the black market. Gilles takes the cards and uses them to regain access to the Ambit. What Gilles didn't count on, however, was the fact that the owner of the UNI cards, Facia Corporation, had put them on the black market for a purpose. Gilles becomes their newest recruit, and an unwilling Ambit tracker. Gilles first assignment for Facia Corpse is to steal some code from a religious park in the Ambit. Gilles never could have imagined that people would pay for a religious adventure, but it takes all kinds. And the adventure is more dangerous than Gilles expected, which he finds out when he is violently kicked offline by a teddy bear. After several failed attempts, Gilles draws on the expertise of his university friends and finally figures out how to get the code out of the park. His reputation as a tracker is secured. Unfortunately, his success also qualifies him for more complicated — and more dangerous — assignments. Gilles' first freelance job is to sabotage the Ambit's new underwater adventure park. He gains access to the park while it's still under construction, then plants some code that makes the grand opening a spectacular failure. What Gilles didn't realize, however, is that the prohibitions on recording in the Ambit don't apply to construction sites. Soon the park's corpse will replay the construction sequence and discover who planted the malignant code. Gilles has to scramble to avoid being discovered. Gilles begins working in the Second Ambit, a more sophisticated online world that includes fully digital inhabitants as well as spectres — people who maintain their online presence even after their real-world existence has ended. Gilles is asked to remove one of these spectres from the system. As Gilles struggles with the ethics of bringing a disembodied person offline, his friend Five gets into real-world trouble. If Gilles leaves the Second Ambit before he completes his task, he may be in a life-threatening situation of his own. If he doesn't, Five may die. E-Eddie hires Gilles to track a wealthy client who suspects that his Second Ambit lover isn't who she appears to be. Gilles tracks her from online zeppelins to digital daycare facilities, discovering that his client's own wife is masquerading as his lover. Why? That's a harder problem. While working on that bizarre case, Gilles also tries to figure out who killed his young friend, Five. This case takes him to the Event Horizon, where he uncovers information that brings even more real-world danger into his life. Gilles is on the run again, without access to the Ambit. He risks getting online through his old friend Boral, but soon he's abducted by Corporate Consortium agents. They weave an unbelievable story of conspiracy and rogue artificial intelligence. They send Gilles to the Event Horizon, where the mysterious E-Eddie contacts him. Gilles fears that E-Eddie may, in fact, be an AI. Which is odd, because E-Eddie is the only one who seems to be helping Gilles. From the professor who first passed him the illicit gold UNI cards, Gilles learns that he's been targeted from the start. Gilles visits one of the pioneers of the Ambit in a digital hospice and learns how AIs were initially confined to the Third Ambits. He suspects they might have gotten loose. The head of the Corporate Consortium tells Gilles that this information could start a panic if it were to get out. He threatens to incarcerate Gilles. Gilles, however, goes offline completely and heads for the Arctic. Gilles travels to the Arctic to find other trackers who may be able to help him. He discovers several distinct communities of people estranged from his technological age, then unexpectedly confronts E-Eddie on the pack ice. Piecing it all together, Gilles figures out that AIs have evolved. They're not just Artificial Intelligence, they are also Autonomous. They are A-AIs. And they may have built an Ambit of their own. A Fourth Ambit. Gilles has learned that the Terra Array of satellites is riddled with A-AIs — Autonomous Artificial Intelligences. When the satellites come online, the A-AIs will be able to seize control of all earthly computation: stock markets, military systems — everything. Gilles races to find a way to prevent it, but will he be in time? Gilles' incarceration comes to an end even as his story does. He is faced with a chilling — and ironic — decision. From 1999 to 2001, The Ambit Group produced a series of audio dramas, beginning with an adaptation of the Dawson Nichols play, I Might Be Edgar Allan Poe. It was recorded over one weekend with a group of Seattle actors, and then a month was spent editing and mixing. Original piano music was composed, sound effects were created, and the combination of simple technology and sophisticated story-telling techniques resulted in the popular radio program that aired in several countries and on satellite radio around the world. The next year was one of significant experimentation. Virtual Solitaire was a less-traditional story, and telling it required ramping up the technology. Special effects from various sources including both digital and analog synthesizers combined with more exotic sound processing to draw the listener into a virtual world described with sound. Everything came together in 2001 for the nine-part sci-fi series, The Fourth Ambit. This massive undertaking based on all-new material took nearly a year working full-time to complete. Sound recording and sound manipulation technology were pushed to new limits. 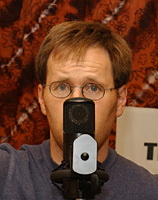 Hours of original music and effects were created. 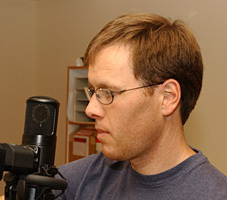 Special microphones and state-of-the-art processing software were combined in new ways. The futuristic world of Ambits within Ambits is rich and detailed, and as the tale unfolds, we meet dozens of characters. Because of the difficulty of keeping actors under contract for a full year, a bold decision was made — the recording cast was reduced to a single actor. 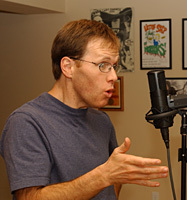 Dawson Nichols not only wrote every word of the script, he also voiced every character himself. The biggest crowds and most raucous overlapping conversations are all him, carefully mixed on up to 40 simultaneous audio tracks. Meet Joseph Walker, a patient at the Oakbrook Mental Health Facility. In this audio drama, Joseph obtains access to a cassette recorder and then creates an audio letter for his sister Rose. Over the course of several days he introduces her to his doctor and several fellow inmates, one of whom suggests to Joseph that his life bears a striking resemblance to that of Edgar Allan Poe. Joseph then proceeds to familiarize himself with the works of E.A. Poe. His fluency with Poe's work is astonishing — to others and himself. And it is this familiarity, this ease with Poe's works, that leads Joseph to believe that he himself might be the Master of Horror. I Might Be Edgar Allan Poe was written by Dawson Nichols, who also voices Joseph here. Other characters are played by Ian Bell, Kimberly Davis, Peggy Gannon, Basil Harris, Jim Horne, and Tina Kunz. This production is 1 hour 17 minutes. Based on the acclaimed play of the same name, Virtual Solitaire takes place in the digital world of the near future. Computer software has become even more sophisticated, and Nathan has been hired to help calibrate emotional responses for a new adventure game. This precursor to The Fourth Ambit is 1 hour 21 minutes long. Bald Faced Lie is not part of The Ambit Group, but we include this classic sketch comedy album here from our friends at Broken Nose Productions. Ian Bell, Peggy Gannon, David Gehrman, Karen Gruber, Basil Harris, Tina Kunz, and Jim Horne. Want to listen on your phone? Bald Faced Lie is available as a podcast. Open your podcast app and "Subscribe by URL" to ambitgroup.com/BFL.